For first-year or introductory Engineering courses. 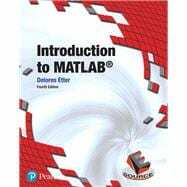 In her 4th Edition of Introduction to MATLAB ,best-selling author Delores Etter provides an up-to-date survey of MATLAB©, the technical computing environment of choice for many professional engineers and scientists. Using a consistent five-step methodology for solving engineering problems, Etter demonstrates the exceptional computational and visualization capabilities of MATLAB and integrates real-world engineering and scientific examples with solutions and usable code. This book is suitable as a primary text for an introductory engineering course or as a supplemental text for an intermediate or advanced course. No prior experience with computers is needed. The text is also useful as a professional reference. Dr. Delores M. Etter, Assistant Secretary of the Navy for Research, Development and Acquisition, leads R&D and acquisition throughout the U.S. Navy. She is the first United States Naval Academy faculty member to hold the Office of Naval Research Distinguished Chair in Science and Technology. Dr. Etter is a member of the National Academy of Engineering, and a fellow of IEEE, AAAS, and ASEE.